Mom, you deserve some flowers! 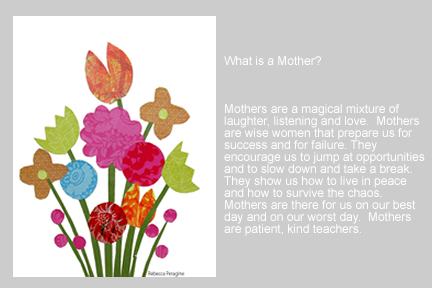 Thank you for being a mother – a wise woman in a circle of wise women. As a special treat from Children Inspire Design, I have created this colorful bouquet for you in honor of Mother’s Day. Please download and print this framable art created in honor you. And share this gift with all the mothers you know- because we all deserve flowers. P.S. I posted it on my facebook page to share it will all of my friends! Hey Beck – that is so wonderful. I hope you have the best Mothers Day ever. Love and miss you!!! I inspired John Heacox, Shannon Miller Madler, Laura Perkins, Robyn Lewis, Loretta Ann Williams, Missy Woods Ripple, Michelle West and Anna Kowalczyk!! I also plan to print it out on quality card stock and frame it for my little girls room.